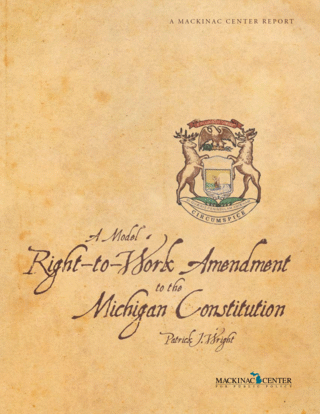 Model language for a right-to-work amendment to the Michigan Constitution appears in Graphic 2. If implemented, this language presumably would be added at the end of Article 1. A. As used in this section, "labor organization" means any agency, union, employee representation committee, or organization of any kind that exists for the purpose, in whole or in part, of dealing with employers concerning wages, rates of pay, hours of work, other conditions of employment, or other forms of compensation. 1. Resign or refrain from membership in, voluntary affiliation with, or voluntary financial support of, a labor organization. 3. Pay any dues, fees, assessments, or other charges of any kind or amount, or provide anything else of value, to a labor organization. C. An agreement, contract, understanding, or practice between a labor organization and an employer that violates this section is unlawful and unenforceable. This section will apply only to those agreements, contracts, understandings or practices that take force or are extended or renewed after this section takes effect. D. Any person who suffers an injury or a threatened injury under this section may bring a civil action for damages, injunctive relief, or both. In addition, the court shall award a prevailing plaintiff costs and reasonable attorney fees. E. This section shall be self-executing. If any part or parts of this section are found to be in conflict with the United States Constitution or federal law, the section shall be implemented to the maximum extent that the United States Constitution and federal law permit. Any provision held invalid or inoperative shall be severable from the remaining portions of this section. * Of course, minor modifications would be necessary to adapt the language to the requirements of statutory law. For example, legislators would need to strike the sentence in clause E indicating that the section was self-executing, and they would likely need to separately amend Michigan’s Public Employment Relations Act (see MCL § 423.201 et seq.). As will be discussed later, the Legislature would also need to decide whether violation of the right-to-work provisions should constitute a misdemeanor offense.